Modern Machine Shop 87 2010s 2000s 1990s 1980s 1970s 1960s 1950s 1940s 1930s MANUFACTURING OF BEARINGS THEN AND NOW demands without a large glut of parts moving through processing. • SURFACES. 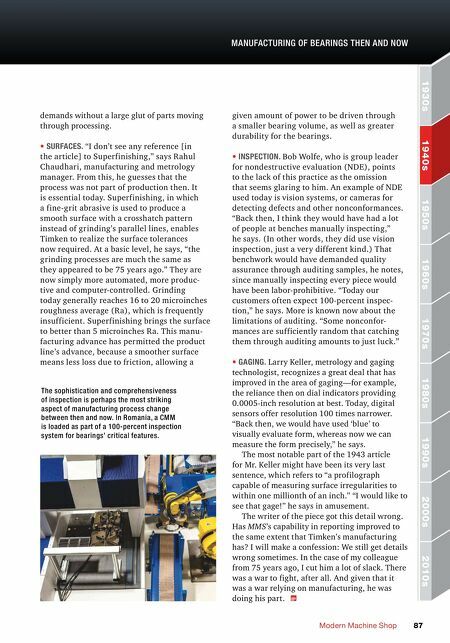 "I don't see any reference [in the article] to Superfinishing," says Rahul Chaudhari, manufacturing and metrology manager. From this, he guesses that the process was not part of production then. It is essential today. Superfinishing, in which a fine-grit abrasive is used to produce a smooth surface with a crosshatch pattern instead of grinding's parallel lines, enables Timken to realize the surface tolerances now required. At a basic level, he says, "the grinding processes are much the same as they appeared to be 75 years ago." They are now simply more automated, more produc- tive and computer-controlled. Grinding today generally reaches 16 to 20 microinches roughness average (Ra), which is frequently insufficient. Superfinishing brings the surface to better than 5 microinches Ra. This manu- facturing advance has permitted the product line's advance, because a smoother surface means less loss due to friction, allowing a given amount of power to be driven through a smaller bearing volume, as well as greater durability for the bearings. • INSPECTION. Bob Wolfe, who is group leader for nondestructive evaluation (NDE), points to the lack of this practice as the omission that seems glaring to him. An example of NDE used today is vision systems, or cameras for detecting defects and other nonconformances. "Back then, I think they would have had a lot of people at benches manually inspecting," he says. (In other words, they did use vision inspection, just a very different kind.) That benchwork would have demanded quality assurance through auditing samples, he notes, since manually inspecting every piece would have been labor-prohibitive. "Today our customers often expect 100-percent inspec- tion," he says. More is known now about the limitations of auditing. "Some nonconfor- mances are sufficiently random that catching them through auditing amounts to just luck." • GAGING. Larry Keller, metrology and gaging technologist, recognizes a great deal that has improved in the area of gaging—for example, the reliance then on dial indicators providing 0.0005-inch resolution at best. Today, digital sensors offer resolution 100 times narrower. "Back then, we would have used 'blue' to visually evaluate form, whereas now we can measure the form precisely," he says. The most notable part of the 1943 article for Mr. Keller might have been its very last sentence, which refers to "a profilograph capable of measuring surface irregularities to within one millionth of an inch." "I would like to see that gage!" he says in amusement. The writer of the piece got this detail wrong. Has MMS's capability in reporting improved to the same extent that Timken's manufacturing has? I will make a confession: We still get details wrong sometimes. In the case of my colleague from 75 years ago, I cut him a lot of slack. There was a war to fight, after all. And given that it was a war relying on manufacturing, he was doing his part. The sophistication and comprehensiveness of inspection is perhaps the most striking aspect of manufacturing process change between then and now. 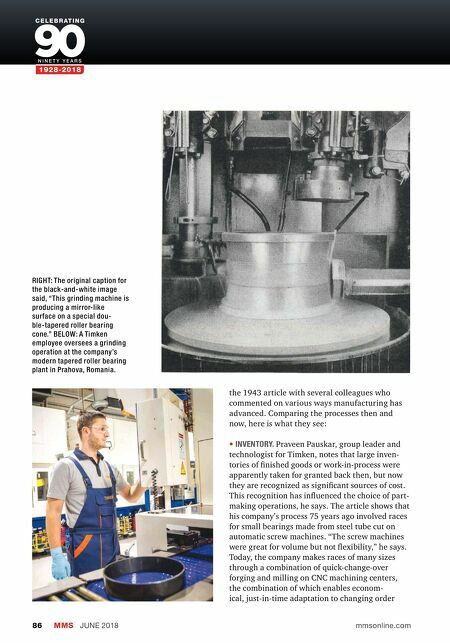 In Romania, a CMM is loaded as part of a 100-percent inspection system for bearings' critical features.